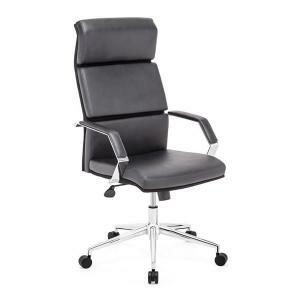 With a full arm and classic shape this is a perfect executive office chair. The Chieftain High Back Office Chair has a leatherette padded seat and back cushions with solid steel frame and fully upholstered arms. There is a height and tilt adjustment with a 5 point steel rolling base. W23.6" x D29" x Height 46.5~48.8", Seat W20", SD19", Seat Height 18.9~21.3", ArmH26.4~28.7"